2018 Arts & Wellness Programming! This year is the 40th anniversary of the Dubuque Area Writers’ Guild anthology and we are completing our compilation in collaboration with another great organization, the Dubuque Facing Project. 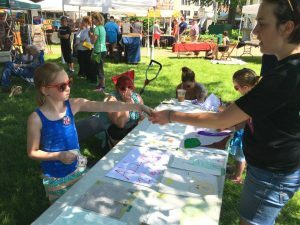 The Dubuque Facing Project is a non-profit organization that “connects people through stories to strengthen communities. [Their] model guides communities as they enlist a team of writers to be paired one-on-one with citizens who are facing life circumstances that deserve to be shared to better educate the broader community. The pairs meet, get to know each other and share stories of triumph and tragedy, of loneliness and community, of hate and happiness, of deep depression and lofty goals.” The Dubuque Facing Project is focused on Facing Diversity and this year we are helping to support the creation of an anthology centered on the stories of Dubuque’s LBTQIA+ community. 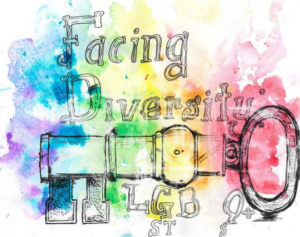 Selected submissions from the Facing Diversity compilation will share their stories. Food and refreshments will be served. This event is free to the public. Books will be available at the reception and are free to the public. 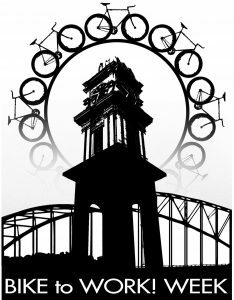 Join the Dubuque Bike Coop and local bicycle enthusiasts in ditching that car and biking to DubuqueFest! The good people from TMBR and the Coop will be on hand to give hands-on demonstrations on how to fix a flat tire and how to keep your bike maintained at home. Bring your own bike and multi-tool to fix it up on the spot! From 7 – 10 pm after the demonstration, volunteers will staff a secure, barricaded bike valet service near the Town Clock so you can watch music the rest of the night worry-free. In October of 2017 Julie Griffin & Friends cleared out a store front on Central Ave. and setup shop for the month. 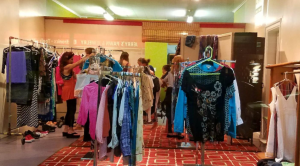 They organized a clothing exchange, then opened up a temporary costume and vintage clothing shop. Summer clothes were sent to Texas, Florida and Puerto Rico to help those affected by the recent hurricanes. Some apparel was also donated to local charities, but she’s got plenty more where that came from! 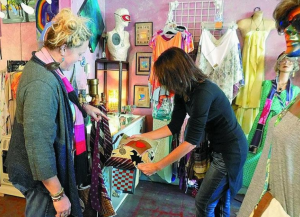 Shop unique vintage finds while you watch live music in the plaza. DubuqueFest’s juried fine art fair in Washington Park features the work of over 70 artists & artisans. We invite you to meet the artists, learn about process & inspiration, and invest in original hand crafted pieces. Shop for hand-blown & fused glass, ceramics, metal work, free form sculpture, painting, jewelry, fiber, fabric, photography, mixed media, textiles, copper work, hand turned wood, watercolors, leather work, wearable art, & more! It’s an art gallery in the park! Free. Visit our Gallery of Artists for a sneak peak of the fair. 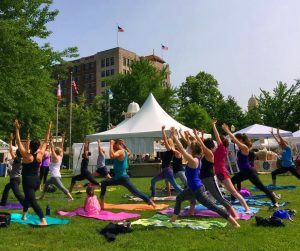 Grab your yoga mat or a blanket and join instructors from Ignite Power Yoga Studio for yoga on the lawn. A gentle morning stretch for all levels. Breathe! We know your creativity knows no bounds! 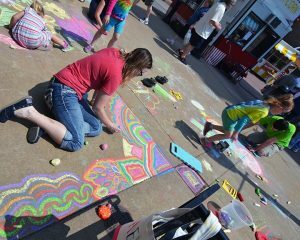 Join other community members in Town Clock Plaza to add a splash of color to the concrete. We’ll bring the chalk, you just show up and show us what you’ve got! Join West Music Dubuque for a lively day of musical instrument exploration. Never played an instrument? No problem! 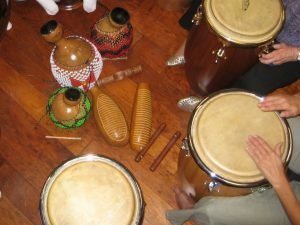 They will have a variety of instruments on hand for you to try out. Discover your hidden musical talents, or if you’ve already got mad skills try something different that you’ve never played before! 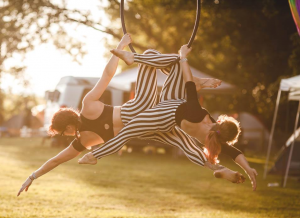 The Eastern Iowa Circus Collective is a group of aerial artists, jugglers, hula hoopers, fire performers and acro yogis who are interested in community building through creative expression. Come watch their gravity-defying stunts! You’ll have a chance to get upside-down on their aerial truss after they perform skillful elevated routines twenty feet in the air. Did you know we also have resources right here in Dubuque that specialize in non-traditional and holistic fitness and wellness routines? Float & Fly Wellness Studio and Statera Integrated Health & Wellness Solutions will be nearby with information on how you can continue the fun after DubuqueFest! Tours will depart from the Gazebo and run for approximately 90 minutes. The Voices Mural Project launched in the summer of 2017 and has transformed the Old Main Historic District with cutting-edge street art. Participants will learn about the world-renowned artists who came to Dubuque for this project and see their work up close. Along the way, you’ll explore the architectural context for the murals and hear how the Voices team brought the project together, plus some updates about what’s next for the Mural Project. Don’t miss this chance to learn more about Dubuque’s newest cultural attraction! Note that the tour ends at 2nd & Main Streets, and includes eight blocks of walking. Watch as Galena’s own Jan Ketza demonstrates the art of Plein Air Painting. 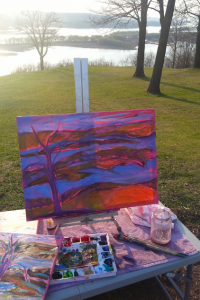 From the French expression meaning “open air,” Plein Air refers to the process of creating a work of art outdoors. You just might find yourself later in the background of an Art Fair portrait painting! Join artist Heather Houzenga for a hands-on interactive art demo at the Gazebo! Pause for a moment and consider what is worth saving. What do you love most that you hope to never lose to Climate Chaos? Be specific and personal. What’s at stake for you? 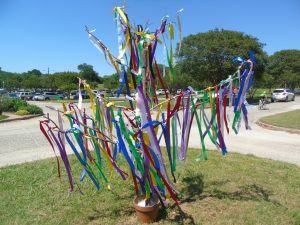 Join other community members in helping to create a powerful Climate Ribbon Tree sculpture showing that we are all connected, affected by, and have the power to impact climate change. 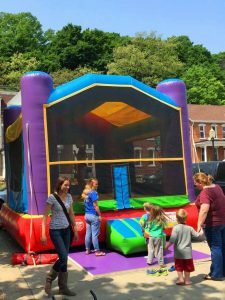 Climbing wall, bouncing castle, super slide, lemonade shake-up slushies, and more from DSM Inflatables! Tickets must be purchased to enjoy amusements. Parents and children are invited to get creative with hands-on projects. 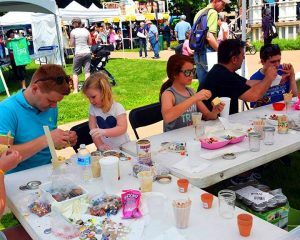 Through a partnership with Green Iowa AmeriCorps, join in the fun of creating sustainable and eco-friendly crafts this year. Meet the members of Dubuque’s own Key City Creative Center! They will have examples of work created using the tools and equipment at the MakerSpace, with selected pieces on sale for public purchase. Yang Style Tai Chi demo with masters Greg & Jayne Miller. 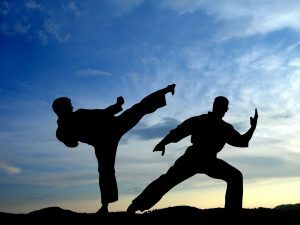 Enjoy the flow of Tai Chi, with Q&A after. 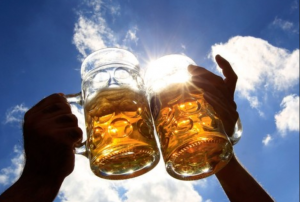 Beer Garden in the Park! Enjoying a frosty beer isn’t just for Town Clock Plaza anymore! Check out our mini beer garden in the park and relax after a nice day of shopping for art. Because kids are artists too! After making your way through our professional artists’ tents, be sure to wander over to the youth art fair sale as well. Participants will be K-8 students from the Tri-State area.